BEIJING - Traffic measures were announced for Beijing on Thursday, including sharply limiting new vehicle registration, in a major effort to tackle gridlock on the capital's roads. Only 240,000 vehicles, about one-third of this year's figure, will be registered next year in Beijing, a city with a population of 19 million, said Zhou Zhengyu, deputy secretary-general of the municipal government, at a news conference. Starting on Friday, car registration will be allocated by a license-plate lottery system, Zhou said. Private car buyers will receive 88 percent, or 17,600 plates per month on average. Two percent will be for commercial use. The remaining 10 percent will go to companies, government institutions and others, Zhou said. 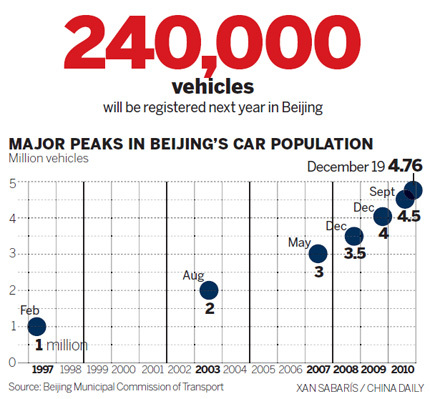 "The number of cars in Beijing has grown quickly as urbanization and modernization progresses. This has caused severe congestion in some downtown areas, especially at rush hour," he added. "Decisive measures shall be taken to control traffic in Beijing. Otherwise, the congestion will only get worse." 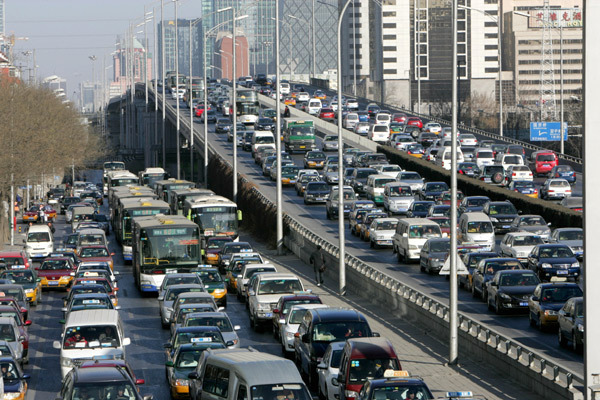 Traffic jams in Beijing have worsened recently. As of Dec 19, the capital had 4.76 million vehicles, 700,000 more than that at the beginning of 2010 and contrasting with 2.6 million in 2005. A global survey conducted this year by IBM said Beijing is tied with Mexico City for the world's worst commute. Concerns are growing that Beijing is choking future growth as it gets more difficult to move people and goods around the city. China eclipsed the United States as the world's biggest auto market in 2009, but worsening air quality and traffic have become hazards in major Chinese cities. The new car registration limits had been anticipated by the public, sparking a buying spree last week. The Xinhua News Agency said 30,000 new vehicles were registered in the past week alone, at least three times the normal rate. According to the city's measures, a Beijing driver will be permitted to own only one car in his or her name but car owners, who replace their old vehicles, will be automatically given new plates and not have to take part in the lot-drawing. Eligible individual applicants include local residents and foreigners who lived in the capital for at least one year. For residents without a Beijing permanent residence permit, they need to provide proof of having paid social security fees and personal income tax for five consecutive years. An individual can apply once every month and an enterprise can apply once every two months, according to officials. Local public security, labor and taxation departments will examine an applicant's qualification before a lottery on the 26th of every month. "We will ensure that both examination and lottery procedures are open, fair and transparent. We will post the results on the website and we are open to any report and complaint from the public if one is found ineligible but granted a plate," said Liu Xiaoming, director of the municipal commission of transport. The city will also prohibit new government cars for the next five years and limit car usage on the basis of odd and even last license plate numbers. Car limits will also be imposed during bad weather, key festivals and when important activities are held. In order to ease traffic congestion, the measures also adjusted parking fee rates which will take effect from April 1. Parking fees inside the Fifth Ring Road will be charged for every 15 minutes rather than 30 and will range from 2 yuan to 10 yuan per hour. Cars registered outside of Beijing will be banned from inside the Fifth Ring Road on work-day rush hours, from 7 to 9 am and 5 to 8 pm. Zhou said Beijing will also charge congestion fees "at the appropriate time". The measures sparked a buying spree on Thursday with many 4S stores in the capital remaining open until midnight. "As long as you make the purchase before midnight, you can get around the license limit," a salesman surnamed Wang with a Honda 4S store in Fengtai district told customers in the evening. "I think these measures will achieve the desired effect to curb traffic congestion. By limiting car license plates, people will be encouraged to take public transport," said Duan Liren, a professor specializing in transportation at Chang'an University. If car purchase is left uncontrolled, the whole transport system in Beijing may soon collapse, he warned. In addition, Beijing vowed to enhance traffic infrastructure and set a target of public transport accounting for 50 percent of city travel in 2015. "Among all the measures, the priority should be given to public transport," said Zhang Changqing, director of the transportation law institute at Beijing Jiaotong University. "Experiences from other countries suggest that smoother and more convenient public transport will make more people turn to it and in turn help improve the whole traffic situation," he said. Li Yao and agencies contributed to this story.